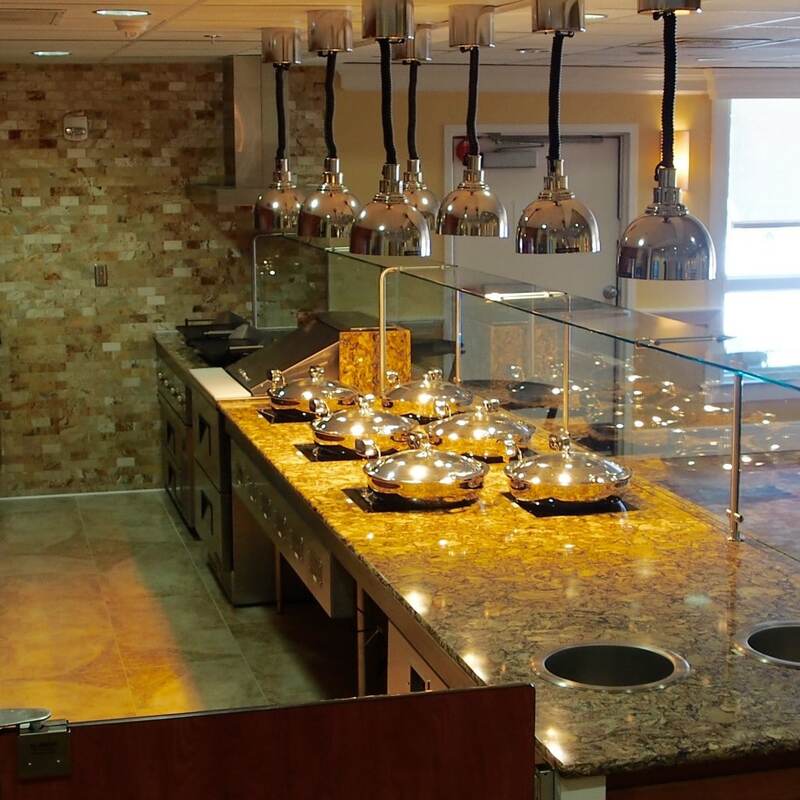 Enhanced Dining in the Jewish Home encourages residents to eat at their chosen time and to sit with their friends. 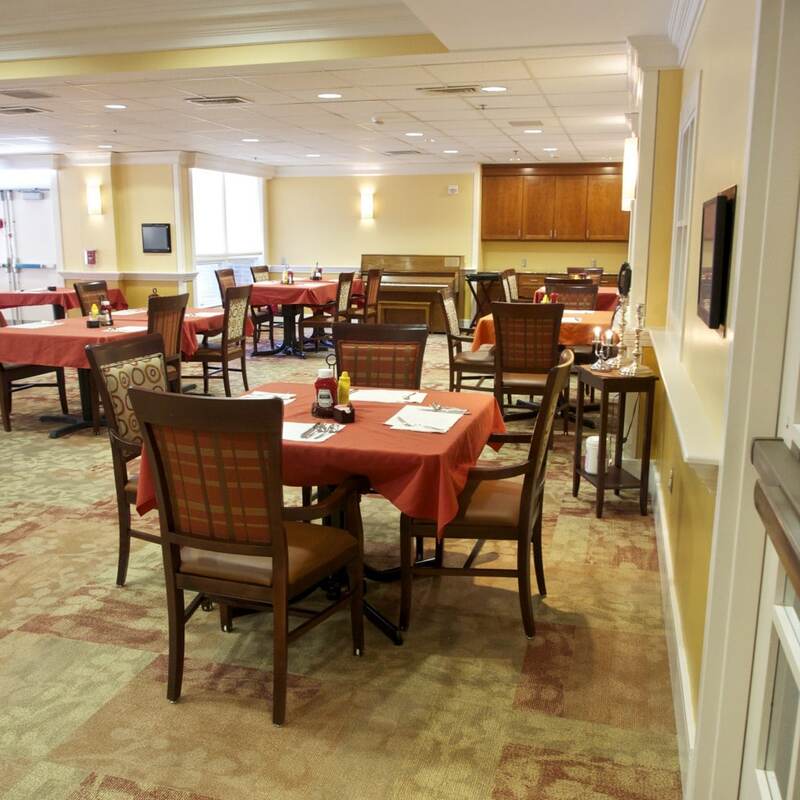 And now, residents enjoy the newly renovated, state-of-the-art Dining Room. Walls have been moved to accommodate more residents in greater comfort. This also makes it easier for staff to move around. New lighting makes the area look almost sun-lit, even on the very grey days we have been having. There are computer screens on the walls so that staff can readily document what residents are eating and if they are getting the nutrition they need. The stunning cherry cabinetry holds all sorts of storage. Above the countertop are tiled backsplashes, which are both functional and decorative. The new induction cooktops have been installed, and there are warming lights above to maintain food at proper temperatures. The new refrigeration, ice maker, microwave and other accessories are already in use! In place of the old Venetian blinds, the back windows that overlook the patio have new sheer shades that let in pleasant light but block annoying sunlight. The new shades are much easier to keep clean than the old blinds. And the new exit door to the back patio is complete; this makes it easier for residents to go outdoors for cookouts or just to enjoy lovely weather. Instead of dishes on trays, our residents have their flatware and platters placed right onto tables, just as they would in their own homes. There are flowers or other decorations on the tables. And the tables in the renovated Dining Room are specially designed to accommodate wheelchairs better. The new Dining Room chairs come in a couple sizes so everyone will have a chair that fits, and many chairs have sliders to make it easier to move residents closer to the tables. Of course, residents who wish to— or must—remain in their wheelchairs may certainly do so. Perhaps best of all, our chefs can prepare soups, salads and other foods right there on the new equipment. This greatly enhances the homelike atmosphere we wanted when we designed the renovations. A registered dietitian supervises menu planning and evaluates residents’ dietary and nutritional requirements and adjusts individual needs if they are compromised. An excellent dietary staff prepares and serves Kosher food, including physician-prescribed special diets. Our dietitian considers the food preferences of our residents when she plans meals and always assures that alternate items are available.